Change has come to the newspaper industry, and you're right in the middle of it. YOU'RE LOOKING at a sports page from the ePost-Standard. It's a real newspaper, not a website. Many of you might feel that it's easier to read than an old-fashioned print newspaper, but it still looks like the familiar daily paper that so many of us have come to love. This screen capture was taken from a 7-inch high-definition Android tablet. There are free iPad and Android apps for the ePost-Standard, and you can read it from a computer, too. Newspapers keep changing. Ben Franklin, who printed a newspaper in colonial days, would know right away what the Post-Standard is. He could hold it in his hand and leaf through the pages. He could read every part of it without wondering what to call it. But the ePost-Standard? That would really fly his kite. As you probably know, The Post-Standard , the printed-on-paper version of the daily newspaper in Syracuse, has been trimmed down to save costs -- and, of course, to keep it alive. Newspapers around the country have been doing the same thing. You might say this is a bad time for the newspaper industry. But in fact this is mostly a time of upheaval. Whether it's a bad time or just a major transition isn't clear. All we know at this point is that change has come to the newspaper industry, and you're right in the middle of it. You could hardly find a better example of this kind of change than the ePost-Standard. That little letter stuck on the font of the name gives you a clue. The ePost-Standard is much different from the old way of doing things. It's not a traditional printed newspaper, of course. That's a dying breed. But just as importantly, it's also not a website. If what you really want is a newspaper, the jumble of images, videos and headlines on a typical website simply won't do. A newspaper should look like a newspaper. If it doesn't, call it something else -- a "news feed," maybe. Or something like "Slate" or "The Huffington Post." If you subscribe to the printed newspaper already, the "e" version is free. If you just want to read the ePost-Standard without subscribing to the print version, the cost is $2.99 a week. That's a bargain. To subscribe or find out more about subscribing, go to www.syracusemediagroup.com/subscriber-services/epost-standard/. 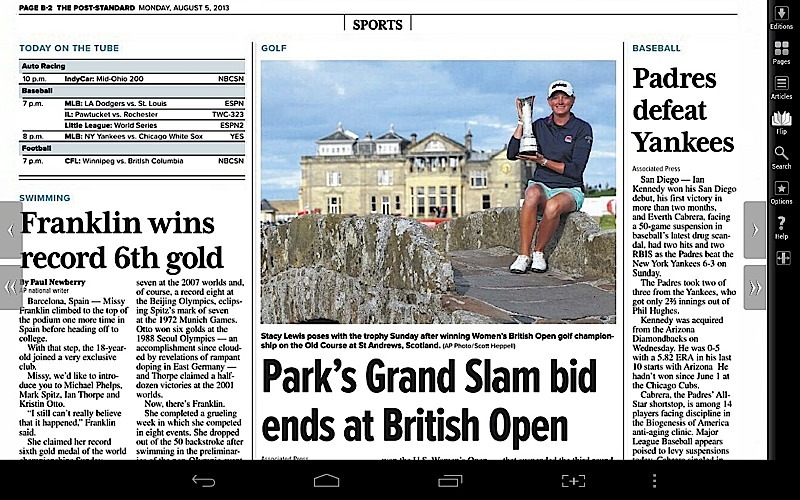 You can read the paper on the web using any computer, or, better yet, you can use a free iPad or Android app. Years ago, I helped put together the web version of The Post-Standard, called Syracuse Online. The website is still going strong, but the ePost-Standard is a totally different experience. You can read the entire paper -- classified ads, crossword puzzle, supermarket ads and, of course, all the news content, including letters to the editor -- exactly as it all appears in print. You can zoom in on any story or ad, and you can instantly view any story in regular text -- a lot easier to read on a screen than the columns of type in the newspaper. Reading the ePost-Standard the other day, I was reminded of helping my son David deliver newspapers when he was a kid. Those dark mornings seem like Cave Man days now. Newspapers are cool at last. They're growing up.